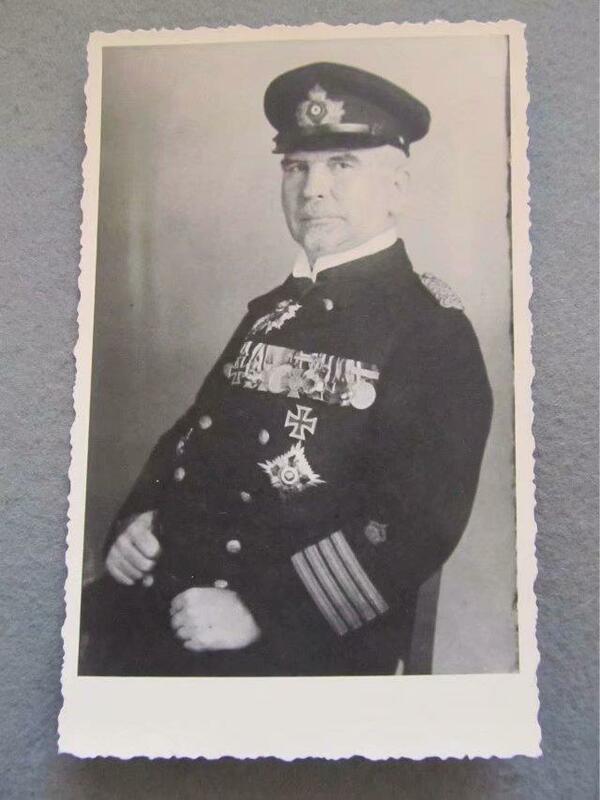 I want to start this thread where I will post different photos of Croatian WW2 Generals that served in the Austro-Hungarian army during WW1. I need help with identifying their awards. 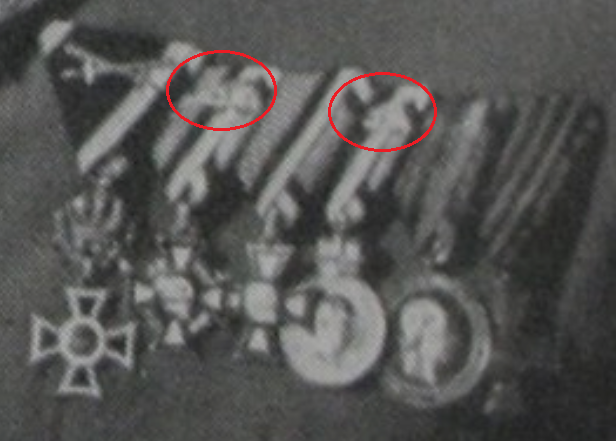 Sometimes there will be other decorations (not just Austro-Hungarian) and I hope you can help me ID those also. First up is General Vladimir Laxa. 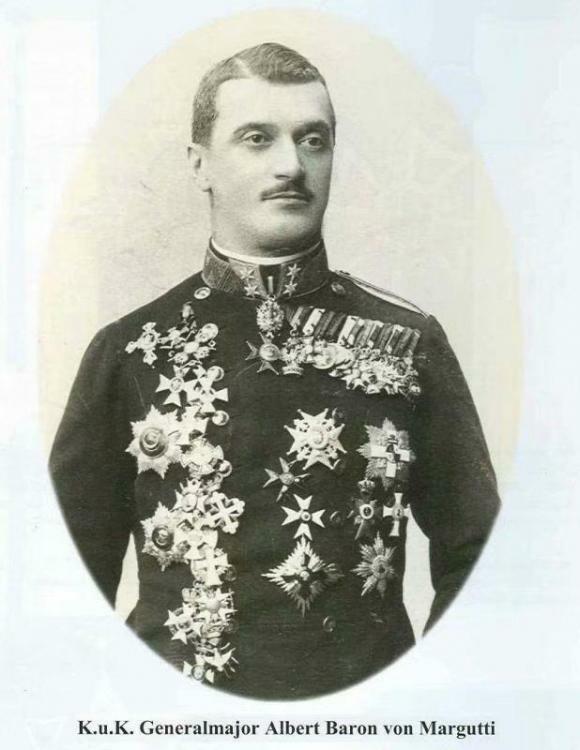 Holder of the Knight's Cross of the Military Order of Maria Theresa. 3 Military Merit Cross 2nd Class with War Decoration and Swords ??? 4 Order of the Iron Crown 2nd Class with War Decoration ??? 6 Military Merit Cross 3rd Class with War Decoration ??? 12 Grand Cross of the Romanian Order of the Crown ??? Please tell me if you agree with my "???" and also write the class of the awards if you know them. You can also write the names of the awards in German. #7 A-H Merit Cross Verdienstkreuz? 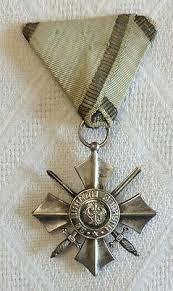 #8 A-H Signum Laudis [Military Medal of Merit--class?]? I dont know if this this is on display in your picture? Yes tony. 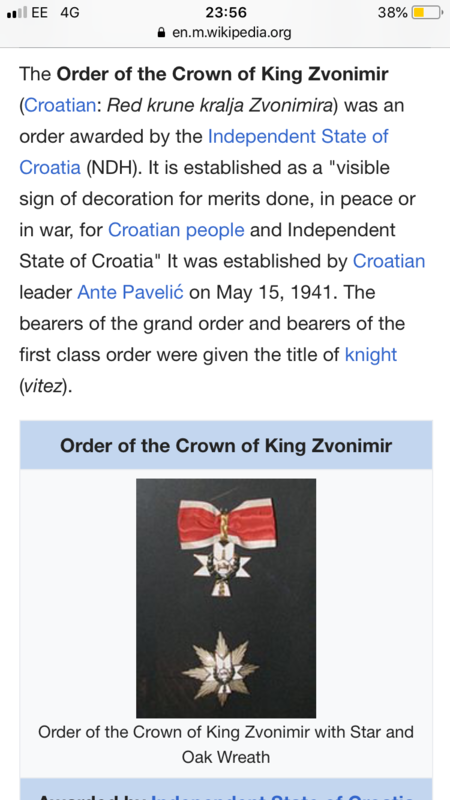 According to my sources he was awarded the Grand Cross of the Order of the Crown of King Zvonimir with Star and Swords. He is not wearing it on the photo though. 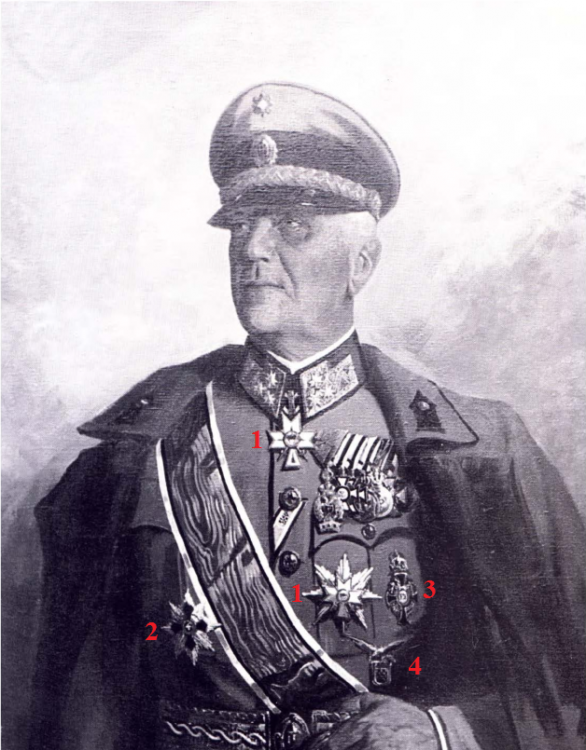 So #13 is the Grand Officer's Cross of the Bulgarian Order of Military Merit? 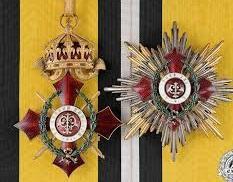 Is the class of the Romanian Order of the Crown (number 12 on the photo): Grand Cross or Grand Officer? Medal bar (the medals are mounted very tight so I didn't numerate them), 6 or 7 medals? - Order of the Iron Crown 3rd Class with War Decoration ??? - Military Merit Cross 3rd Class with War Decoration ??? - Military Merit Cross 3rd Class (peace version) ??? Perhaps one more medal after the cross-shaped one? #4 Looks like Croat shield surrounded by "U" [Ustasha symbol] surmounted by an eagle? Some sort of air force or staff badge? Must check a reference book. Except for "U" somewhat similar to A-H Devil's Division badge. At 2nd button hole, maybe a so-called Croatian Commemorative Badge, 1942-3, signifying service in the Croatian Army for over 1 year including six months or more at the front. 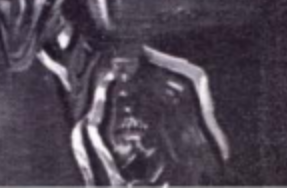 #2 See the photo below for the bottom of the sash from the painting. Seems to be the Grand Cross of the Bulgarian Military Merit Order. 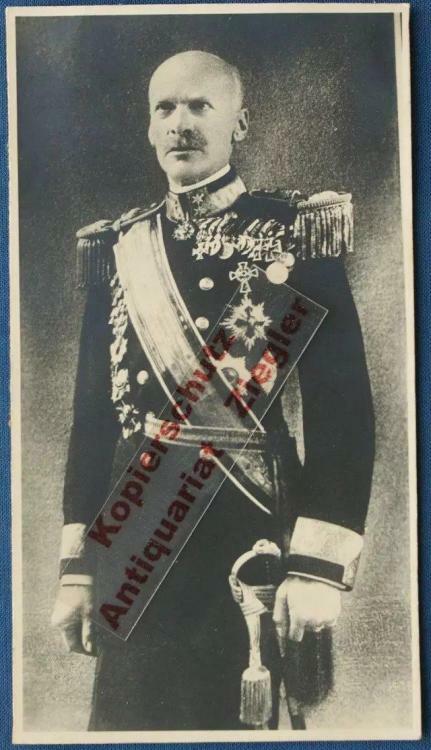 #4 Štancer commanded the 25th Royal Croatian Home Guard Regiment during WW1. That regiment was part of the 42nd Home Guard Infantry Division (Devil's Division). So it is quite possible this award is as you say, the A-H Devil's Division Badge. But on the painting it looks a little different (perhaps the painters fault). Any idea about the medal bar awards? Generally, a bow at the Bulgarian sash juncture would suggest a Grand Cross, lack of a bow = 1st class--I cannot distinguish what's there. If the painter accurately portrayed the sash, dimensions & stripe widths = lst class. 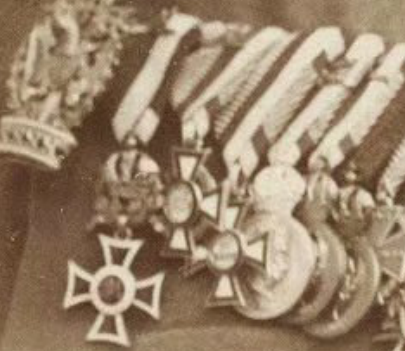 A-H awards on bar = Iron Crown, Merit Cross/Verdienstkreuz with and another without KD, & rest too much for my eyes. But 1st Class of the Bulgarian Military Merit Order is the Grand Cross? Do you then think it's the Grand Officer? Only the 1st class (Grand Cross) wears the sash: "I grade, Grand Cross. Awarded to senior state officers and military personnel. It was worn with a sash over the shoulder." After 1936, the Bulgarian MMO comprised 6 enameled classes + 2 unenameled crosses. 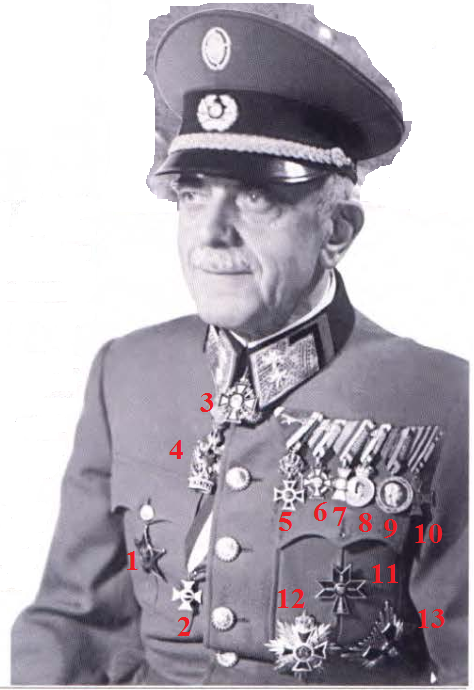 Grand Cross, First Class, [both with sash, badge & 8 point star but differing details like star body format & sash width and color dimensions to distinguish grade difference], Grand Officer [neck badge, cravat & 4 point star], Commander, Officer & Knight + 2 unenameled crosses. All could be awarded after 1916 with KD [an enameled laurel/oak wreath applied around the obverse center]. This KD appurtenance appeared only for the Order grades NOT the unenameled crosses. Officer, Knight, & unenameled crosses used the Military Bravery ribbon rather than the MMO ribbon to demonstrate KD entitlement. One 'grade' of the unenameled crosses had a suspension crown & the other did not. 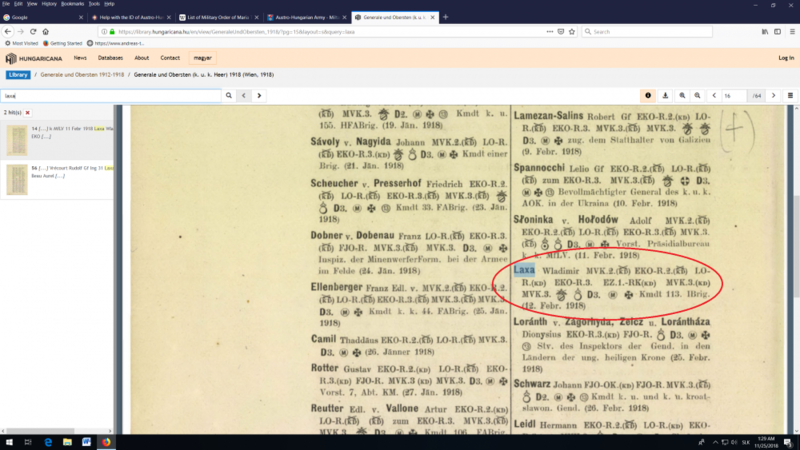 As sometimes typical, wiki's entry is faulty--the actual grade illustrated as Grand Cross on the site you linked [2nd image below] is a First Class with KD insignia set. As for the bar, you can refer to this photo. 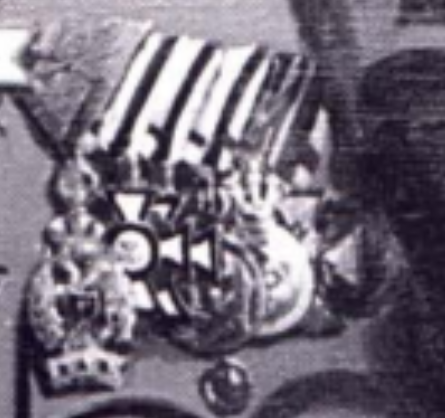 Austria’s military meritorious cross and the “Certificate of Glory” medal can be obtained many times, and the war period must be arranged in front of peacetime. - Order of the Iron Crown 3rd Class with War Decoration and are those Swords on the ribbon ??? - Balkan Mobilisation Cross 1912-1913 ??? Thank you tifes. 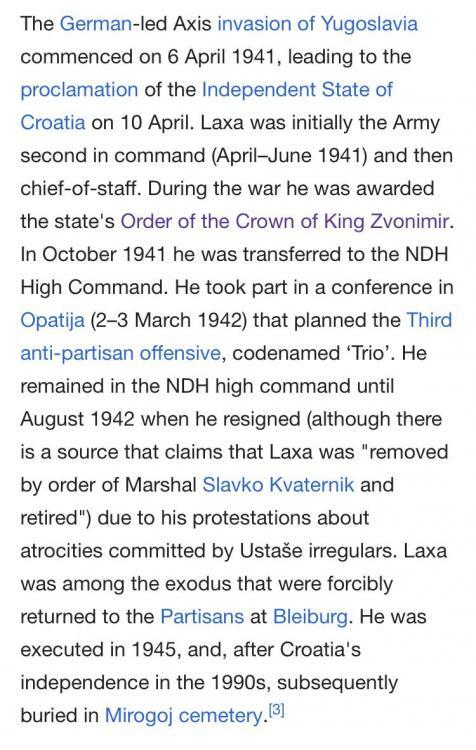 So is Laxa's Bronze Military Merit Medal also on the ribbon of the Military Merit Cross? And could you post a photo of the Military Long Service Decoration for Officers for 25 years? There is no Mobilization Cross 1913 mentioned and he obviously never received it. MMTO knight cross came later on, just after WWI at the 188. promotion in 1921. Thanks. But you said that the last medal on Laxa's medal bar is the Balkan Mobilisation Cross 1912-1913? Absolutely, because it is. I don't have any idea why that medal is there on his uniform. War Medal 1873 is just "gimmick" used by many WWI A-H veterans. That medal was issued in 1873 and was awarded to all combatants of Austrian Empire who took part in some military campaign before WWI. WWI veterans saw it as absolutely normal to put this medal on their uniform after war however it wasn't in the line with official statute. Thank you very much tifes for you help. Greatly appreciated! Is everything correct (the A-H awards listed I mean)? The dates for the awards are from some Croatian sources. You said above "Military Merit Cross 3rd Class with WD (no swords)". 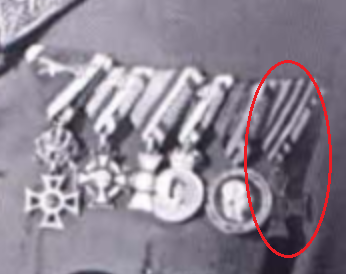 But I think those are swords on the ribbons of both the Military Merit Cross 3rd Class with WD and Bronze Military Merit Medal (Signum Laudis)? See photo below (this is another darker photo). Does the list where Laxa's awards were listed you posted earlier, show Štancer's (also spelt Stanzer or Stancer) awards?